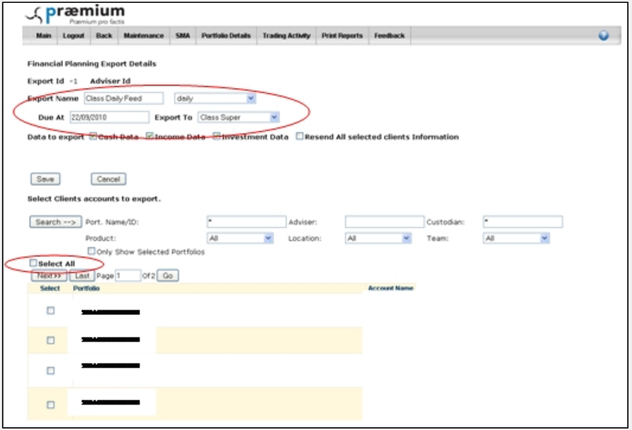 Follow these instructions to activate a data feed from Praemium to Class Super for SMSF and non-SMSF portfolio accounts. The ability to activate the Praemium to Class data feed is dependent on the adviser users access rights within Praemium. Please also note that the images included in these instructions will have changed slightly when compared to the most recent version of the Praemium platform. Intello uses Class Super to administer SMSF and portfolio accounts.Please follow these instructions to setup a data feed from Praemium to Class for your clients. From the Maintenance > User Maintenance menu in V-Wrap, click Change User Details. Type your User ID in the Search By > User ID box. Your User ID is the one you use to log in to V-Wrap. Select “All” or select the specific accounts you wish to have as an automatic feed to Class Super. Once these fields are completed click Save button. If this is a first time feed request or you require a refresh of data, tick the “Resend All selected clients information” option.